Cooking fads come and go. But the recipe for Biscuit Tortoni, a classic Italian dessert, has survived for centuries. This frozen dessert, now called Tortoni, is popular again. When you make it you are connecting with history. As far back as 1896, famed cookbook author Fannie Farmer was making this dessert. Her recipe, published in "The Boston Cooking School Cook Book," is pretty basic. You combine condensed milk, water, vanilla, and whipped cream. Sherry and crumbled macaroons are added to the mixture and it is frozen in paper cups. The 1979 version of the cookbook calls for light cream (half and half), sherry and whipped cream. Home cooks soon discovered they could achieve the same results by folding crushed macaroons, candied cherries, and sliced almonds into vanilla ice cream. I did this for a large party and it was tricky. In order to fold in the ingredients I had to let the ice cream soften and fold in the cookies, cherries and nuts quickly. Everyone raved about the dessert. I've also made a version published by a local grocery store. But I won't make it again because it contains uncooked eggs, which many consider unsafe. Cheryl Boyer writes about this historic dessert in her "Orlando Italian Food Examiner" article, "Simple to Make, Easy to Love... Biscuit Tortoni." She thinks the recipe was invented in the 18th century. "This delectable dessert is now known and appreciated the world over," she writes. Her article contains an updated recipe that uses whipped topping, rum extract, and beaten egg whites. Why is this dessert popular again? One reason is that you can make it ahead of time. Some recipes ask you to freeze the mixture for 24 hours, while others recommend four hours. Pillsbury has developed an ice cream version of the recipe. Crumbled macaroons (or vanilla wafers), chopped salted almonds, and chopped candied cherries are folded into vanilla ice cream. The individual servings are topped with red and green candied cherries. My updated recipe is quick to make, festive to look at, and delicious to eat. For Christmas color, I substituted salted pistachios for the almonds. Instead of macaroons, I used crushed Amaretti cookies, crisp, almond-flavored cookies imported from Italy. These cookies are available at discount stores, specialty groceries, and are also available on the Internet. For best results, buy ice cream flavored with pure extract and vanilla bean seeds. End your holiday dinner with flare! 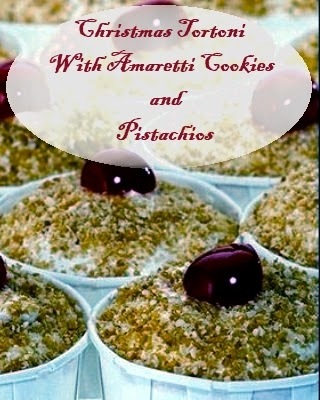 Serve Quick Christmas Tortoni with Amaretti Cookies and Pistachios. Line a muffin tin with foil or holiday muffin cups. Let the ice cream soften a bit in a large bowl. Using a rubber scraper, quickly add the crushed cookies, pistachios and red cherries. Spoon mixture into muffin cups and top each one with a whole cherry. Cover with non-stick aluminum foil and freeze for at least four hours. Makes 8 festive servings. Harriet Hodgson has been an independent journalist for 35+ years. Her 26th book, "Smiling Through Your Tears: Anticipating Grief," written with Lois Krahn, MD, is available from Amazon. Centering Corporation has published several of her books, including "Writing to Recover: The Journey from Loss and Grief to a New Life," and a companion journal, "The Spiritual Woman: Quotes to Refresh and Sustain Your Soul," and "Happy Again! Your New and Meaningful Life After Loss." Hodgson has two other new books, "101 Affirmations to Ease Your Grief Journey" and "Real Meals on 18 Wheels: A Guide for Healthy Living on the Highway," Kathryn Clements, RD, co-author. Both books are available from Amazon. Please visit Hodgson's website and learn more about this busy author.